It’s kinda cute and highly amusing watching City fans suddenly pretend to be all radicalised about the prices Arsenal are charging for this Sundays match. Us reds and fans of other bona-fide big clubs like Tottenham and Liverpool are watching City fans in the same manner that a bloke in his thirties would look at a suddenly politicised sixteen year old who’s begining to realise that the world isn’t a very fair place. The followers of Manchester City making a stand on a moral or principle of conscience does not correspond or sit easily with any of their behaviour historically. Are these are the same City fans who were gleefully manipulated by the Daily Mirror for the ill fated Forward With Franny campaign in 1993? 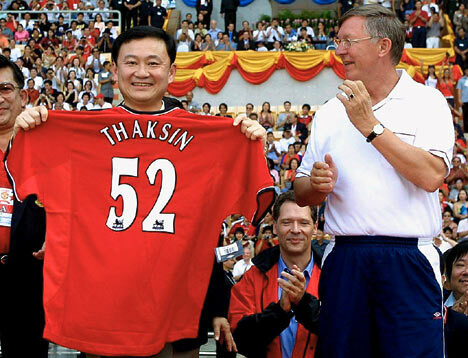 In 2008, they enthusiatically welcomed the fugitive and deposed Thai prime minister and at the time, alleged human rights abuser and now convicted crminal, Doctor Thaksin Shinawatra. If City fans had a history of millitancy in the way of, for example, West Ham fans whom succesfully fought the imposition of a bond in the 1990s or the way Liverpool fought to destroy the blatantly obvious cover up over Hillsborough and the way United fans revolted in 1998 against the BSkyB bid (succesfully) and the Glazers in 2005 (not so), I’d have more respect. The fact is that the club and its fans have willingly dropped their drawers when owners came along throwing money around like confetti without any thought of principle, particularly during the Thaksin Shinawatra regime that makes the boycott/protest risible.